Rainier hiking Spray Park gives you a lot for your investment of time and sweat. And this hike is a lot less crowded than hikes with trailheads at Paradise and Sunrise. Let's find out if this is a hike you'll want on your "must do" list of the best Mount Rainier day hikes. You're going to have to work a little to get to the trailhead for Spray Park. And if you have a vehicle which you don't want to take on a gravel road, this isn't the hike for you. Head east on State Route 410. At Buckley, turn south on SR165. Enjoy the little towns of Burnett and Wilkeson, and maybe keep them in mind for refreshments or a meal on the way back from your hike. Here's the best part of the drive: a one lane bridge over the steep Carbon River gorge. No chance to stop and gawk, but you can pull over on your way back to Wilkeson and take it all in. After the bridge, you need to hit a Y-junction on your right. Near the twelve mile mark, you'll see a parking area for Paul Peak on your right. 17 miles (total) of gravel road later, you'll be at Mowich Lake, with plenty of parking and a lovely picnic spot if you decide that you'd rather not hike. All of this effort means fewer people on the Spray Park trail! Head toward the walk-in campground at the end of the Mowich Lake road, where you'll see a cluster of tents and probably people milling about. Notice the outhouse (rather a nice one, recently updated to national park specifications), and you'll find the trailhead to the left of it, descending into the woods. There is no entrance fee station. This hike is going to challenge you aerobically, as you gain a lot of elevation in just three miles. The last half mile up to the park will be the most brutal, so be sure you're well hydrated and fueled up for it. This hike has a a lot of variety, and some options for exploring. All boots take the first .25 miles of trail, downhill to a junction. You want the well signed Spray Park Trail. The first two miles take you upward through the forest, with only one good viewpoint of Mount Rainier, a short but worthy side trip at Eagle Cliff. Near the two mile point, you can call it a satisfying day by diverting to Spray Falls, just a short distance on a spur trail. The spray on a hot day will perk you up, and maybe inspire you to tackle the last mile of at least 20 switch backs. Grant Creek's music will keep you company as you climb higher and higher, to where fantastic views in Spray Park await. Once the creek's lovely voice fades, you'll break out into the first of the meadows. You can wander slowly along the trail for another mile or so, admiring the outcrops of rocks and the hardy alpine plantsas you gain the best Mount Rainier views. If you've got plenty of gas left in your tank, you can take a trail upwards to your right, heading toward Echo Rock and Observation Rock. Snow might linger well into August, so be sure you're good on your feet and use your trekking poles for balance. Or you can stay on the main trail and hike onward to admire the views of Mother Mountain, Hessong Rock, Fay Peak (named for Fay Fuller, first recorded woman to ascend Rainier), and Mount Pleasant from your highest point on the hike: 6,400 feet. The trail plunges downward to Seattle Park, into the Carbon River drainage basin. 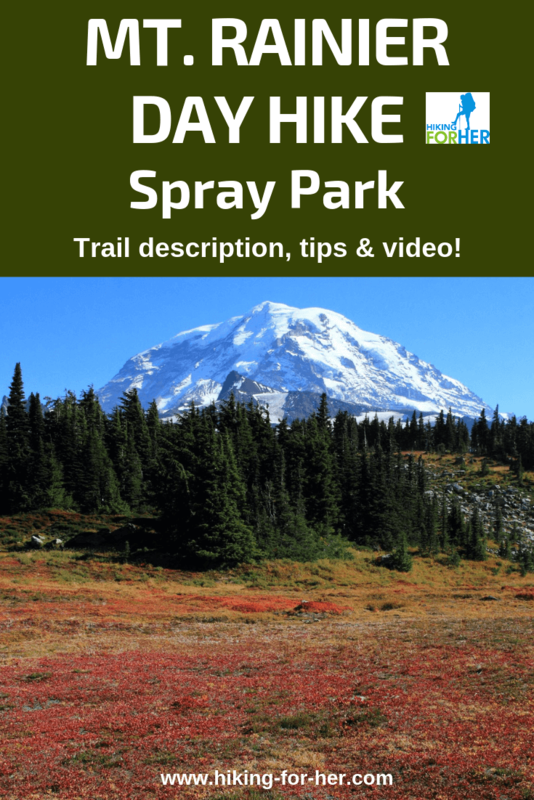 Come along with me on a hike to Spray Park on a bluebird day in September. To get the most out of the wildlife closeups (including a yawning bear), view this video full screen! There are three categories of cautions to keep in mind if you decide to hike to Spray Park. Seventeen miles of gravel road with potholes and dust, as well as local vehicles wanting to go much faster than seems sane, might put you off the whole idea. After a heavy rain, those potholes will be muddy - and slick if you hit them too fast. A car with low clearance can make it to the lake without damage, but you're going to have to go very slowly unless you appreciate the fine art of bottoming out. A moderate clearance vehicle won't have any trouble at all. Regardless of vehicle, everyone will "enjoy" washboarding in mid summer and fall. If you're an optimist, think of it as a massage for your internal organs as you shake, rattle and roll. Black bear are known to enjoy the vegetation and water sources of tarns and run off in Spray Park (watch video). Respect their right to enjoy their own living room, without interference or food from you. Your footsteps off trail will damage plants which are struggling to survive in a harsh environment, even in the autumn when it appears they are finished for the year. Pick a rock for your lunch break. Some of the bushes which blaze with color in the fall are decades old, despite their short stature. Your boots can disturb their shallow root systems before you can blink an eye. And respect any blocked social trails which are trying to recover from the pounding of boots. You'll see rocks or branches carefully placed across them, as a clear signal to avoid them. Spray Park borrows its name from the waterfall you'll pass on your way up: Spray Falls. Rumor has it that a trail construction crew named it, way back in 1883. I'm guessing they enjoyed the cooling effect on a hot work day. For the first three tenths of a mile on the trail, you're on the famed Wonderland Trail which rings Mount Rainier. A mind blowing array of flowers in high summer (July and August). Spectacular fall colors on sunny days in September. The thrill of watching mountain creatures going about their daily routines. And a trail taking you through open forest, past a thundering waterfall, and breaking out into seemingly endless meadows, rocky outcrops and twinkling tarns, with a knockout view of Mount Rainier. I try my best, but I may have left out details which are important to you as a hiker.